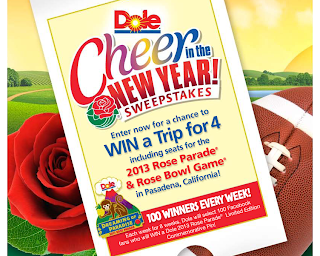 DOLE "Cheer in the New Year" Sweepstakes! It's almost that time to start thinking on New Year’s, and I have a great sweepstakes opportunity that will really make you WANT to think about New Year's! As a first place float winner for two years in a row, they’re working on a 3-peat and sending one lucky DOLE fan a trip to Southern California to experience the magic of DOLE’s spectacular Rose Parade float in person. DOLE is celebrating the New Year with their third Rose Parade float, “Dreaming of Paradise,” and as part of the DOLE excitement, DOLE is giving one lucky DOLE fan a trip for four to cheer on DOLE's 2013 Rose Parade float and watch the 2013 Rose Bowl. This trip is a dream come true for those who have always wanted to experience Southern California's iconic New Year's Day celebration. Entering is simple! “Like” DOLE on Facebook, enter your email address and fill out the sweepstakes entry form at www.Facebook.com/DOLE. Anyone over the age of 18 and a legal US resident may enter to win! The grand prize winner, plus their three guests, will celebrate their victory with a four night trip to Los Angeles – from December 30, 2012 to January 3, 2011 – to see the DOLE float in the 2012 Rose Parade on New Year’s Day in beautiful Pasadena, California. The winner and their guests will also receive four tickets to the 2013 Rose Bowl to watch two of the best college football teams fight to become the 2013 Rose Bowl Champion. The sweepstakes runs from October 7, 2012 to December 3, 2013. In addition, DOLE will award 100 randomly selected weekly prize winners a 2013 DOLE Rose Parade Limited Edition Commemorative Pin for each week for eight weeks. A total of 800 lucky DOLE Facebook fans will take home a prize!